On 4th May 2016 evening I met Hon'ble Speaker of the Lok Sabha Smt Sumitra Mahajan and briefed her about the sansad ratna awards. She was quite receptive and appreciated the initiative. I also told her as to how Dr Abdul Kalam was showing keen interest in recognising outstanding Parliamentarians. I presented her the book 'Manifesto for Change' authored by Dr Kalam and Ponraj Vellaichamy who have devoted one full chapter for our sansad ratna awards. I shared with her some of our concerns about the quality of discussions in the Parliament. I gave the complete analysis of the performance of top 10 performers till the end of Part I of Budget Session 2016, based on the data provided by PRS Legislative Research. I appreciated the firmness with which she conducts the House particularly during question hour and zero hour without allowing disruption. I presented her the 100th edition of our e-zine PreSense. Shri Arjun Ram Meghwal, MP Bikaner (Rajasthan), one of the Sansad Maha Ratna Awardees and one of the judges for the selection of awardees of 16th Lok Sabha helped us to meet Madam Speaker and he was also present. She also explained to me the initiative taken by her to educate the MPs with more knowledge through research, so that they participate more effectively in discussions. 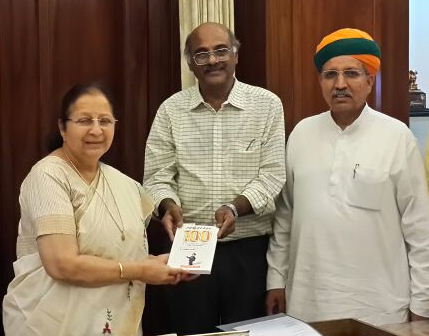 She appreciated our Sansad Ratna initiative and extended her full support. I told her that Sansad Ratna Award is an initiative from the civil society, strictly based on the performance parameters. During our discussion, Smt Sumitra Mahajan was quite receptive and keen about getting my views and sharing her views, in spite of the fact that we could meet her at 7 pm in the midst of her tense schedules. - By Prime Point Srinivasan, President, Sansad Ratna Awards Committee.